Forest Kindergarten is back- summer 2015! After the resounding success of our pilot Forest Kindergarten in 2014, we are delighted to offer an expanded version of the program in 2015! 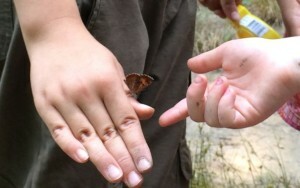 Forest Kindergarten is designed to provide nature based learning opportunities for children aged 4-6 years. 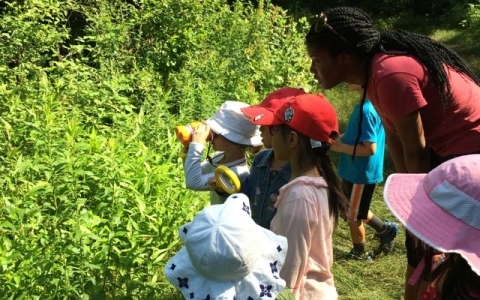 Children engage in a self-guided exploration of the forest, helping them to build an early connection with nature, as well as critical thinking skills and a curiosity about the natural world. Our instructors also use positive reinforcement to help build empathy and communication skills. Unlike our other family programs, Forest Kindergarten allows parents to drop their children off for a period of 2.5 hours each day. We take shelter indoors in the case of heavy rain or lightning, but children otherwise spend the entire time outdoors exploring Spot Pond and the adjacent forest. This “place-based” approach to education gives children the opportunity to connect meaningfully with this particularly beautiful section of the Fells. This year, the program will be offered for 12 consecutive weeks, from June – August 2015. Children will be enrolled weekly, and classes will take place Monday – Friday, from 9:30am-noon. At a programming fee of $10 per hour, the total weekly cost will be $125. Please note FoF members will have the opportunity to register early (beginning May 4th) and will also receive a $25 discount. Registration will be available to the general public beginning May 11th. Classes fill up quickly so please plan to register early! To verify your FoF membership is current, login here: www.friendsofthefells.org/member-log-in/. Do you need to sign up for all 12 weeks? Katie, no, you do not need to sign up for all 12 weeks. You will be able to sign up for as many weeks as you wish, depending on availability. Heather, that is a great question and I can see why it’s not clear. This was our announcement blog post, which was posted before the actual registration page was available. The page for the program is available at http://www.FriendsoftheFells.org/forest-kindergarten/ and all the registration info can now be found there.